1. Office fo Civil and Defense Mobilization. Personal Prepardness in the Nuclear Age (December 1959) (Student Interim Manual); 108 pages, 19 illus. 3. Department of Defense, Office of Civil Defense. Family Guide. Emergency Health Care (1962); 60 pages, 27 illus. 4. Office of Civil Defense Mobilization. H-11-1 Emergency Sanitation at Home. A Family Handbook (Revised to August 1958); 22 pages, 8 pages of illus. 5. Department of Defense. Defense Civil Prepardness Agency. SM 14-1 Emergency Rescue Training (January 1974)(Pocket Edition); 48 pages, 40 illus. 6. Department of Defense. Office of Civil Defense. FG-E-5.9 Handbook for Radiological Monitors (April 1963); 41 pages, 8 illus. 7. Department of Defense. Office of Civil Defense. Instructions for Filling. The Civil Defense Water Storage Container (1962); 7 pages, 7 illus. 1. 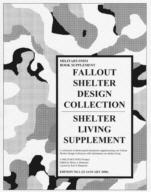 We also have two other book supplements along with this supplement: Shelter Design Supplement and Basic Fallout Shelter Survey, as well as the basic book: Fallout Shelter Design Collection. Shelter Design Supplement contains 17 additional shelter designs. Basic Fallout Shelter Survey has detailed instructions on evaluating urban and rural struction for radiation shielding.